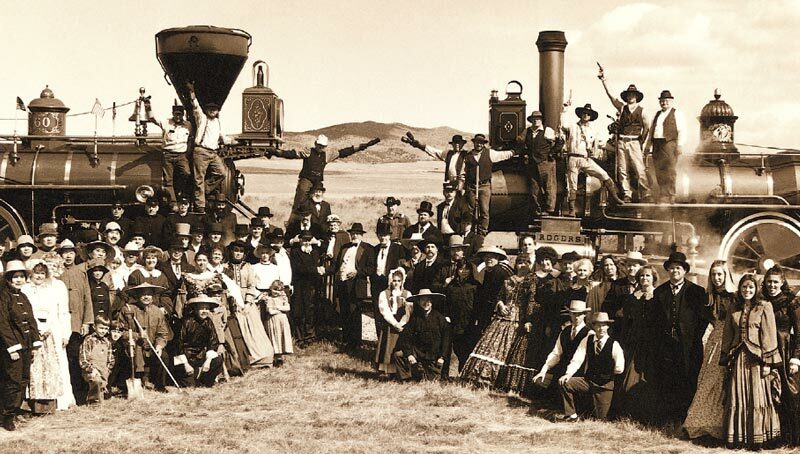 A couple of days ago marked the 147 anniversary of the joining of the Central and Union Pacific Railroads at Promontory Summit, then in Utah Territory. The completion of a rail and telegraph system in the United States was nothing short of revolutionary with regard to the future development of the country, the way business was conducted after its completion, and the way life was lived thereafter. It connected people in ways many at the time could not have previously imagined, making the world a faster moving, more efficient, and more tightly connected place. The rate at which communication was increased by its completion is comparable, in my mind, to the ways in which modern times’ social media has made the world smaller, and drawn the human race closer than ever before. The speed and ease of communication and connectivity are of paramount importance to the evolution of societies today, as in the past. The Transcontinental Railroad is a prime example of this. This Photo & Five Features Promontory Summit, Utah Territory, and the joining of the Union Pacific and Central Pacific lines, completing the Transcontinental Railroad. The photo above is of the official ceremony celebrating the joining of the rails. This ceremony is still reenacted at the Golden Spike National Historic Site in UT. Below are your five facts. Enjoy! On May 10, 1869, at Promontory Summit, UT Territory, the final spike of the Transcontinental Railroad was driven into the track by Leland Stanford, signifying the completion of the railroad and the connection of the line from Omaha, NE to Sacramento, CA, thus completing a railway system across the U.S. from east to west. The completion of the Transcontinental Railroad meant that travel across the country was reduced from months to about 1 week. As the railroad was constructed, the telegraph system was connected with the railway stations, making communication among people across the country quick and more efficient that it had ever been before. The ceremony joining the tracks could be considered to be one of the first “mass media events” in American history. Using the telegraph, each hammer stroke was transmitted as a click across the country to telegraph stations. When the spike was completely set, telegraphs announcing the railroad’s completion were transmitted. It was originally anticipated that the completed railway would be greatly used to facilitate trade with the east (India, China, and Japan), with products arriving through San Francisco and then making their way eastward, and then on to Europe. This did not happen, however, as the Suez Canal was opened the same year (1869), which then provided the shortest eastward sea route from Asian countries through Europe to the eastern US. According the Stephen Ambrose’s Nothing Like it in the World, 95% of the completed railway’s use was for “local traffic,” meaning within the U.S. The “local traffic” served to make the western U.S. a more complete part of the union than ever before by easing the transportation of people, goods, services, and expediting communication.